Note that this page details both Pteranodon longiceps, which has three known variants, as well as Geosternbergia (which was formerly classified as a species of Pteranodon). Pteranodon and Geosternbergia are large pteranodontid pterosaurs native to much of the North American Midwest during the late Cretaceous period, 88 to 80.5 million years ago. At the time, this area was a large shallow ocean called the Western Interior Seaway. They are among the largest known pterosaurs, and are notable for their extremely distinct sexual dimorphism. The first remains were found in the Smoky Hills Chalk of western Kansas by Othniel Charles Marsh in 1870, and named by Marsh in 1871. It was the first pterosaur to be discovered outside of Europe by paleontologists, and was originally named Pterodactylus oweni. However, that species name was already occupied (though it has since been reclassified), so Marsh renamed his discovery Pterodactylus occidentalis. He also named the largest specimen Pterodactylus ingens, and the smallest specimen Pterodactylus velox. The remains consisted mostly of wing bones. Around the same time, Marsh’s rival Edward Drinker Cope discovered wing bone fossils which he assigned to the genus Ornithocheirus (though he misspelled the name as Ornithochirus). He named two species, Ornithochirus umbrosus and Ornithochirus harpyia. The paper naming these species was published in 1872, only five days after Marsh’s. As the rivals recognized that the fossils they had named belonged to the same species, debate occurred over which name should be given priority. In 1875, Cope relented and allowed Marsh’s classification to take priority, but maintained that the umbrosus species was distinct from Marsh’s other species of Pterodactylus. Later paleontologists would disagree with Cope’s conclusion, determining that P. umbrosus was not a distinct species. On May 2, 1876, Samuel Wendell Williston discovered the first-known skull of the animal near the Smoky Hill River in Kansas. Shortly after, a smaller skull was also discovered. Williston alerted Marsh, his employer, to the discovery; Marsh noted that the skull lacked teeth and possessed a bony crest on the head. These features were distinctly different from other known pterosaurs at the time, prompting Marsh to reclassify the animal. No longer a member of Pterodactylus, the genus was christened Pteranodon, meaning “wing without teeth.” The species recognized at the time included Pteranodon occidentalis and Pteranodon ingens, along with the newly-named Pteranodon longiceps; the specific epithet of this new species refers to the length of its skull. Three other species Marsh named at the time included Pteranodon comptus, Pteranodon nanus, and Pteranodon gracilis. The final of those three was named based on a wing bone which he had mistaken for a pelvic bone. He recognized his mistake, however, and reclassified it as Nyctosaurus gracilis. Samuel Williston would return to question the classification of all Pteranodon genera beginning in 1892. He had learned of toothless pterosaur jaws discovered in England’s Cambridge Greensand which were assigned to the genus Ornithostoma, and suggested that Pteranodon should also be given this name as it was discovered later. This decision was never formally accepted, however. In the end, the two names were recognized as separate genera, and neither incorporated the other. At one point, Williston believed that there could be seven Pteranodon species; as of 1903, he narrowed this down to just three species. These were the small P. velox, medium-sized P. occidentalis, and large P. ingens. Both P. comptus and P. nanus were reclassified as Nyctosaurus, and Williston considered P. longiceps to potentially be the same species as either P. velox or P. occidentalis. In 1910, the classification of Pteranodon species would be challenged yet again. George Francis Eaton was the first scientist to describe the whole skeleton of the animal, using this information to determine that Pteranodon longiceps was a valid species and Pteranodon velox was not. This three-species conclusion was upheld for decades. The discovery of a new species by George F. Sternberg in 1952, named Pteranodon sternbergi later in 1966 complicated the situation, as it was found to have a prominent upright crest. As many of the skeletons were headless, paleontologist Halsey Wilkinson Miller argued in 1972 that only the fossils that had known skulls (Pteranodon longiceps and Pteranodon sternbergi) should be considered valid species. Eaton and Miller would go on to name several other species, assigning them into three subgenera. First, the long-crested species P. longiceps and P. ingens, which was renamed as P. marshi, were classified in the Pteranodon subgenus. Second, the tall-crested species P. sternbergi and the newly-named P. walkeri were classified in the subgenus Geosternbergia. Third, P. occidentalis was renamed as P. eatoni and classified in the subgenus Occidentalia. Today, the only recognized genus is Pteranodon longiceps. In 2010, Alexander W.A. Kellner reclassified P. sternbergi as Geosternbergia sternbergi, and also named a new species Geosternbergia maiseyi. 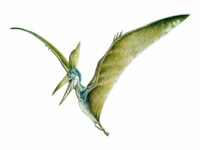 Paleontologist S. Christopher Bennett has suggested that Geosternbergia, which existed slightly earlier in time, evolved directly into Pteranodon. Throughout the history of paleontology, around 1,200 Pteranodon fossils have been discovered in Kansas, Alabama, Nebraska, Wyoming, and South Dakota. This makes it more common than any other known pterosaur in the fossil record. Some possible Pteranodon remains are known from Skåne, Sweden and from the East Coast of North America. International Genetic Technologies cloned the first Pteranodon sometime between 1986 and 1993, along with Geosternbergia, which at the time was classified as Pteranodon. 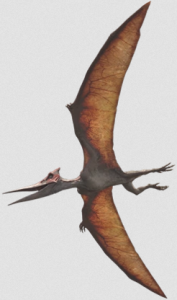 At least one variant of Geosternbergia and three variants of Pteranodon have been created, which Jurassic-Pedia has classified as three subspecies for the sake of clarity. The subspecies are Pteranodon longiceps longiceps, which is known only from Isla Sorna; Pteranodon longiceps hippocratesi, an aberrant subspecies with teeth, which was released from Isla Sorna in 2001; and finally Pteranodon longiceps masranii, which was first hatched in 2004 or 2005 and is the only known surviving subspecies. It is not known if any Geosternbergia are still alive. Adult P. l. longiceps raises its wings while perching, making a display posture to nearby pterosaurs. All four of the pterosaurs described here have similar features. They are all members of the family Pteranodontidae, which itself is a part of the pterosaur suborder Pterodactyloidea. This means that they are among the short-tailed pterosaurs. In all four, the beak is quite long and has a pointed tip; the sharpest and widest belongs to P. l. masranii, while the beak of P. l. longiceps has a slightly hooked end rather like a fish-eating bird’s. The head and neck differ between the pterosaurs in a few other notable ways, though the overall anatomy is similar. The most obvious difference are the small, triangular teeth of P. l. hippocratesi; these are an aberrant feature, and are presumed to be the result of genetic engineering (intentional or accidental). The head crests differ between the two genera and among the three P. longiceps subspecies. In Pteranodon, the head crest is roughly triangular and points backward from the skull; in fossil specimens, the crest is significantly less prominent in the male, but at least P. l. hippocratesi, they appear to have been engineered to be more or less equal in size. In P. l. masranii, the females’ crests are much smaller. The head crest of P. l. longiceps is narrower and slightly bent, while P. l. hippocratesi has a mostly straight crest. Of course, the crest of the male Geosternbergia is tall, erect, and has a forward-facing protrusion which makes it immediately distinguishable from Pteranodon. In all four, the tongue is narrow and pointed, and does not appear able to extend out of the beak. Size varies among these four pterosaurs. 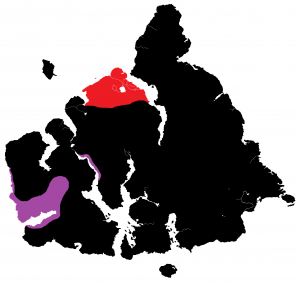 Below is a list of each of their physical dimensions, including all three subspecies of Pteranodon longiceps and its fossil ancestors, as well as both species of Geosternbergia as it is not yet known which species InGen succeeded in cloning. 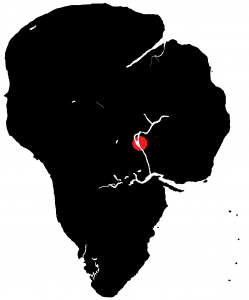 Dimensions for Geosternbergia are based on the fossil record. Pteranodon longiceps longiceps. This is presumed to be a male, though some have suggested that Geosternbergia instead represents the male of this subspecies rather than being a separate genus or species. The neck is long and somewhat flexible. 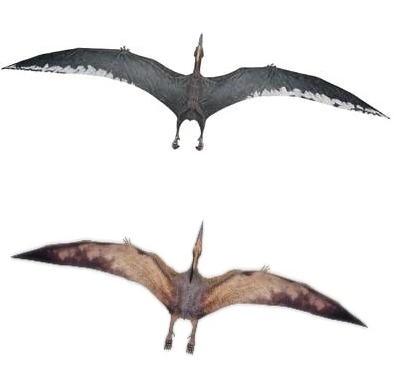 Much of its overall body size consists of its wings; Geosternbergia maiseyi has a wingspam of up to 7.25 meters (23.8 feet), though the species cloned by InGen may have been the slightly smaller G. sternbergi. Size among the Pteranodon longiceps subspecies is more variable. In the fossil record, the male of this animal reached wingspans of 5.6 meters (18 feet) to 6.25 meters (20.5 feet); female P. l. masranii reach similar sizes, though fossil females have wingspans of only 3.8 meters (12 feet). What are presumed to be male P. l. longiceps are somewhat larger than female P. l. masranii, while female P. l. hippocratesi have broader wingspans yet. They are also the heaviest subspecies, with males weighing five to six hundred pounds according to Flyers. In the Jurassic Park /// arcade game, Jurassic Park ///: Park Builder, and the Jurassic Park /// Field Guide, the male (referred to as “Giant Pteranodon“) is much larger than the females, having a 14-meter (45.9-foot) wingspan according to the latter two. The “giant” or “alpha” P. l. hippocratesi, generally believed to represent the male of the subspecies. Fossil Pteranodon longiceps are estimated to weigh between 20 kilograms (44 pounds) to 93 kilograms (205 pounds) in adult males; P. l. masranii females weigh 66 to 70 pounds as adults. In contrast to the junior novels, the Jurassic Park /// Field Guide lists “giant” Pteranodons as weighing 180 pounds, though it still gives them 45-foot wingspans. 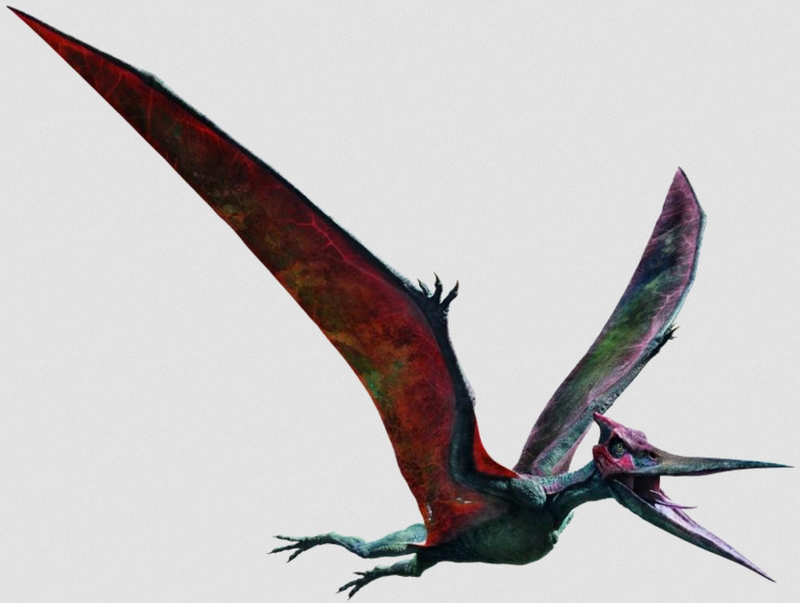 The standard Pteranodon is said to have a 30-foot wingspan and weighs 120 pounds. According to the mobile application Jurassic World Facts, the body length of a Pteranodon is about eight feet and the wingspan is twenty-four feet (a different entry claims it is 24.6 feet); it is unclear which subspecies this is meant to refer to. The mobile game Jurassic World: The Game, which features what appears to be a male P. l. masranii, describes their wingspan as ranging from twenty-six to thirty-three feet, which would make it larger than any Pteranodon known in the fossil record. Despite this, the game’s fact file claims that P. l. masranii is most similar to fossil specimens out of all three subspecies. When standing on all fours, an average adult Pteranodon is roughly as tall as a human, though some can easily grow to a larger size than this. Adult female P. l. masranii displaying its expansive wing membranes. Note that, when not flaring its wings as a form of display, it is a quadruped. The wings of Pteranodon and Geosternbergia are formed from the arm bones, as with all pterosaurs. The majority of the wing membrane, called the brachiopatagium, stretches from the tip of the fourth finger to the hips. In addition, all four have a smaller membrane called a propatagium which stretches between the shoulder and the elbow. There are three exposed fingers, as well as the fourth one that supports the wing. The membrane is muscular in order to allow the animal to achieve powered flight. Part of the membrane stretches to the tail, though this is not particularly prominent; this membrane is called the uropatagium. The tail itself is short and stiff, and reaches up to 25 centimeters (9.8 inches) long. Wing morphology differs between InGen’s pterosaurs and their fossil counterparts; the wings of fossil pterosaurs have rounded tips, while InGen’s have narrow, pointed wingtips. 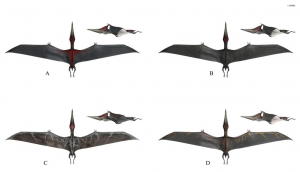 Overall, InGen’s pterosaurs have less membrane surface area than the extinct versions, which may increase the effort required to remain airborne. The muscular wings and strong upper body of the Pteranodon allow it to fly at high altitudes, though its piscivorous diet means that it is often seen closer to sea level. The legs and feet are substantially different than those of fossil pterosaurs, having very bird-like anatomy that permits them to grasp. While Geosternbergia has not been observed using its feet to grasp objects, all three subspecies of P. longiceps have been known to do this extensively, whether it is to perch bipedally or grab prey items. The legs are very muscular, and the feet have four toes; one of these resembles a thumb. When walking, they use a quadruped gait, with the wing finger held upward. Flight in fossil pterosaurs was achieved by pushing off with the wings from a quadrupedal position; InGen’s pterosaurs use a variety of other methods to achieve flight, such as standing on two legs and jumping while forcefully flapping the wings, or standing into the wind and spreading the wings wide. Why they opt to use these more energy-consuming methods is unknown, but may be a result of their altered leg and wing anatomy. According to the mobile application Jurassic World Facts, the flight speed of a Pteranodon is twenty-five to thirty miles per hour. This same application describes their flight pattern as similar to the modern albatross, though P. l. masranii flies with near-constant wing strokes rather than gliding with occasional flapping. It may fly with rapid flaps at times, while using thermal updrafts from the ocean to fly slowly at other times. This model depicts the animal with a coat of pycnofibers, but these are absent in specimens that have been directly observed. Fossil pterosaurs are believed to have had coatings of pycnofibers, which are similar to feathers or hair. However, among InGen’s pteranodontids, only Geosternbergia possesses pycnofibers. The others have bare, leathery skin. Some models of P. l. longiceps do depict it with a full coating of pycnofibers; this variant has never been observed directly. Coloration among the pteranodontids is quite variable. Geosternbergia has a blue body, white countershading, and a yellow beak and crest. The wing membranes are yellow-green. Somewhat similar coloring is seen in Pteranodon longiceps longiceps, but its body has a greener tone, and the beak and crest are darker in color than Geosternbergia. Some artwork has depicted them with a red crest, blue body, white countershading, and yellowish-tan wing membranes. The junior novel Survivor describes one with red and gold wing markings. Female Pteranodon longiceps hippocratesi are generally tan or pink in color, though the dorsal side is patterned black or gray. The face has elaborate patterning with yellows, tans, pinks, and grays decorating the head and beak, while the crest is colored similarly; the eyes have dark orange sclerae and round black pupils. The area around its eyes, as well as its throat, are red or pink. Its wings are generally lighter in color than the dorsal side of its body, and often have dark mottling toward the tips. A darker-colored individual, presumed to be a male, has been depicted in a number of sources; it is mostly gray, with white or very light gray markings near the wingtips. The neck has whitish speckling and the crest becomes bright red toward its tip, but it lacks other significant coloring. The junior novel Flyers describes a senescent male P. l. hippocratesi with plain brown colors and a sexually-mature adult with crimson markings, a sexually mature female with blue and gray markings, and four subadult males; one of these has gold-tinged wings, another has silver streaks on the wings, a third has red wings, and the final one has blue and red spots on its wings. Pteranodon longiceps masranii has a more subdued, grayish body color in most individuals, though some have reddish, bluish, purplish, or brown shading. The undersides of the wing membranes are orange, with some black or gray streaking, and the face and crest have a tough mask-like covering which may be red or blue. Some individuals have a similar color down the spine, while others have white or pale yellow stripes on the wings. Juveniles of P. l. hippocratesi have been observed. They have a color pattern similar to the adult females, but less elaborate and lighter-toned. Young juveniles, often called “flaplings,” are capable of flight already despite not being as powerful as adults. Upon hatching, the wings are actually fully developed; while they are within the egg, the wings are tightly folded. The crests are very small at this stage, and grow out as the animals mature. The head is proportionally larger, and the eyes are considerably larger in proportion to the head. At the stage at which the flaplings were observed, they had wingspans of approximately nine feet and body lengths of three feet and two inches. Flapling P. l. longiceps can be hatched in the mobile game Jurassic Park: Builder, which similarly depicts them as having smaller crests and larger heads than the adults. The natural growth rate is unknown, but a female P. l. masranii hatched in 2011 or 2012 was fully mature by 2017. This would mean it matures in six or seven years. In the junior novel Flyers, four juvenile male P. l. hippocratesi were strong enough to fly long distances and hunt for themselves and were large enough to be a threat to humans despite being, at most, around a year old. Pteranodon longiceps hippocratesi. The upper individual is believed to be male, while the lower is believed to be female. Considerable confusion exists as to the sexual dimorphism in all four of these animals. In fossil specimens of Pteranodon longiceps, females are considerably smaller than males, with an average wingspan of twelve feet (compared to the average male’s eighteen-foot wingspan, while exceptional individuals reached around twenty feet). Male Geosternbergia typically had wingspans between ten and nineteen feet, while particularly large ones could have wingspans of around twenty-three feet; females averaged half that size. In addition, the crests of females in both genera were short, small, and rounded, while males had longer crests. Males can be identified by their extremely narrow hips, while females have wide hips with large pubic openings in order to lay eggs. InGen’s pteranodontids do not appear to follow these patterns. For a time, there was some speculation that InGen’s Geosternbergia was the male form of Pteranodon longiceps longiceps, while all of the P. l. longiceps were the females of this single species. This has not been confirmed as fact. All individuals of these two taxa that have been observed so far resemble males of their respective genera, but their actual sexes have not been confirmed. 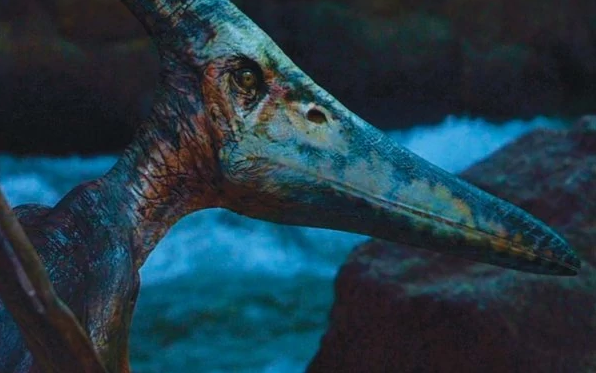 Canon consultants have since treated Geosternbergia as separate from Pteranodon, suggesting that InGen did create both genera separately and that they are not intended to represent sexual dimorphism within a single species. Pteranodon longiceps hippocratesi females can achieve thirty-two-foot wingspans and possess the long crests of males, though adult males have never been observed directly. A model of a dark-colored, red-crested individual of this subspecies exists, and is generally assumed to represent the male. In the Jurassic Park /// arcade game and in Jurassic Park /// Builder, the dark-colored presumed male is depicted as being significantly larger than the females with a 14-meter (49.5-foot) wingspan, but the junior novel Flyers depicts them as being roughly the same size. Aside from coloration and maximum hypothetical size, there do not appear to be any differences between the sexes. Only females of Pteranodon longiceps masranii have ever been observed. They have very short and small, but triangular, crests; however, they have 18-foot wingspans, making them as large as the average adult male in the fossil record. What appears to be a male version of P. l. masranii appears in the mobile game Jurassic World: The Game, though the Code 19 dialogue still refers to it as a female; it possesses the longer crest of the male. In-game factoids describe it as having a 26- to 33-foot wingspan, while the Jurassic World website gives 18 feet as its wingspan. This would mean that males are between 31% and 45% larger than females, compared to the fossil record’s range of males being 33% to 41% larger than females. If correct, this would mean that Pteranodon longiceps masranii is more or less comparable to fossil P. longiceps in terms of sexual dimorphism, the main exception being its significantly larger size. Pteranodon and Geosternbergia are both marine species, living on coastlines. In prehistory, they inhabited the Western Interior Seaway, a shallow warm-water ocean which separated North America into two subcontinents during the Cretaceous period. Their preferred habitats are rocky islands and cliffs near the ocean, where they can remain safe from terrestrial predators and search for fish and other prey. Pteranodon, at least, appears to be highly migratory; Jurassic World researchers estimate that they would range over territories spanning 120 miles or more. Their habitat must consist of more than 430,000 square feet and contain a large, deep body of water. However, they may venture into desert and grassland environments where larger water sources are rare. An aviary was constructed in Jurassic Park on Isla Nublar to contain Pteranodons. However, no DNA from this species was maintained on-site, and the animal itself would likely not be put on display until Phase II of the Park’s operation. This aviary was situated on the Jungle River and was bordered to the east by the Stegosaurus paddock. The main tour road, as well as the Jungle River Cruise and one service road, would have crossed through the aviary. To the north and south, the aviary would have bordered undeveloped land, while to the west it would have bordered some undeveloped land and the southeasternmost corner of the Proceratosaurus paddock. It is unknown how many Pteranodons were present on Isla Nublar as of June 11, 1993. However, based on Jurassic Park: The Game, there were at least three or four Pteranodon longiceps hippocratesi on the island at the time of the incident, which escaped confinement and traveled northward and eastward across Isla Nublar before disappearing. Three were sighted near the eastern mountain range on June 12, and one was sighted north of the Visitors’ Centre near the Western Ridge later that evening. Their location after the incident is unknown. In 2004, a new aviary was constructed on Isla Nublar near the northern end of the Jungle River to house the Pteranodons. Originally the structure was going to be made of glass, but the pterosaurs were able to break the glass using their beaks and escape. This necessitated the development of a new transparent polymer to use instead. 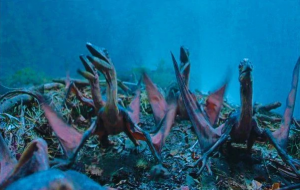 As of August 2004, there were no pterosaurs on Isla Nublar; however, InGen geneticist Dr. Henry Wu had created the first embryos of Pteranodon longiceps masranii by that time, and twelve eggs were incubating. These included one individual (Egg B) exhibiting polydactyly on one wing, meaning it bore an extra finger. According to Dr. Wu, the incubation period lasts for several months; it is not currently known when the first P. l. masranii hatched. Between late 2004 and Jurassic World’s opening date of June 1, 2005, the remaining Pteranodons were removed from Isla Sorna and transported to the Jurassic World Aviary. These would have included any remaining P. l. longiceps and P. l. hippocratesi, though it is not known how many of each remained by that time. Additionally, P. l. masranii would have been introduced to the Aviary as they matured. There do not appear to have been any further attempts to breed the other subspecies, and no Geosternbergia are believed to ever have been on Isla Nublar at all. By the end of 2015, the sole remaining pteranodontid on Isla Nublar appears to have been P. l. masranii. 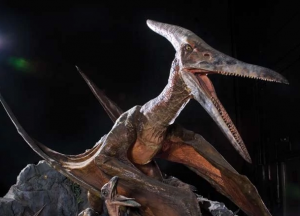 A female Pteranodon longiceps masranii is confirmed by the Dinosaur Protection Group to have hatched in Jurassic World sometime between May 16, 2011 and May 15, 2012. On December 18, 2015, an incident involving the hybrid Indominus rex caused a breach in the Aviary; this permitted the pterosaurs to escape. Upon being released, they initially flocked westward over the forests, but turned south somewhere near the ruins of the old Visitors’ Centre. From here, they flocked toward the largest nearby body of water, the Jurassic World Lagoon. At least 44 adult females were involved in this. The ensuing incident left several Pteranodons deceased; some were shot in defense of JW001 and Simon Masrani, and many were tranquilized in midair by the Asset Containment Unit; some of these either fell from such a height as to sustain fatal injuries or fell into the Lagoon where they likely drowned. One was consumed by the Mosasaurus which inhabited the Lagoon. At least eleven of these animals died during the incident. The survivors were most likely removed from the area by ACU, but by the following morning, they had begun to flock back to the Lagoon as the Security presence had abandoned the island. A photograph procured by the Dinosaur Protection Group and featured in a June 5, 2018 article by Klayton S. confirms the continued presence of P. l. masranii on the island. At least twenty-eight adults or subadults can be seen in the photograph. All of these appear to be female. The location at which the photograph was taken is unknown, but appears to be on one of Isla Nublar’s mountains. According to the Jurassic World: Fallen Kingdom LEGO website, some of the Pteranodons remained near the Lagoon, roosting in the abandoned hotel complex. Others nested on the island’s coastal cliffs. They appear to gradually have migrated north, and on June 23, 2018 they were sighted almost exclusively within the vicinity of Mount Sibo. A flock of at least thirty-five females was seen fleeing from a volcanic disturbance at around midday, and a similarly-sized flock of females could be seen fleeing the island during the most violent part of the volcano’s eruption. At least one was killed during the eruption due to being struck by volcanic debris, while three others were removed from the island via the S.S. Arcadia by the mercenary team led by Ken Wheatley at the behest of Eli Mills. Because all of the known P. l. masranii are female, and there is no evidence of protogyny in this subspecies, the 2018 population size can be used to estimate the 2015 population. At least 35 individuals were seen west of Mount Sibo, and at least 35 were later seen east of Mount Sibo. These two flocks may have been the same group of animals, but if they were two different flocks, there would have been at least 70 animals on the island at that time. Additionally, three were already caged on the Arcadia, plus at least 11 which died during the 2015 incident. This means that, at a minimum, there would have been 84 Pteranodon longiceps masranii in the Jurassic World Aviary before the incident. After the eruption of Mount Sibo, it is likely that many of the Pteranodons fled the island. Some, however, were seen perching on coastal rocks while the eruption continued, and as their diet of fish would have been uninterrupted by the volcano’s activity, it is not impossible for a decent number to have remained on Isla Nublar’s coastal cliffs even after the eruption occurred. Pteranodon longiceps longiceps, Pteranodon longiceps hippocratesi, and Geosternbergia were all cloned by InGen between 1986 and 1993. At least three P. l. hippocratesi were fully mature by June 12, 1993 and were present on Isla Nublar, so it is likely that they were cloned some years prior to this. An aviary was constructed on Isla Sorna to contain the P. l. hippocratesi, but the containment measures for the other pterosaurs is currently unknown. The existence of other aviary structures on the island is currently unconfirmed. 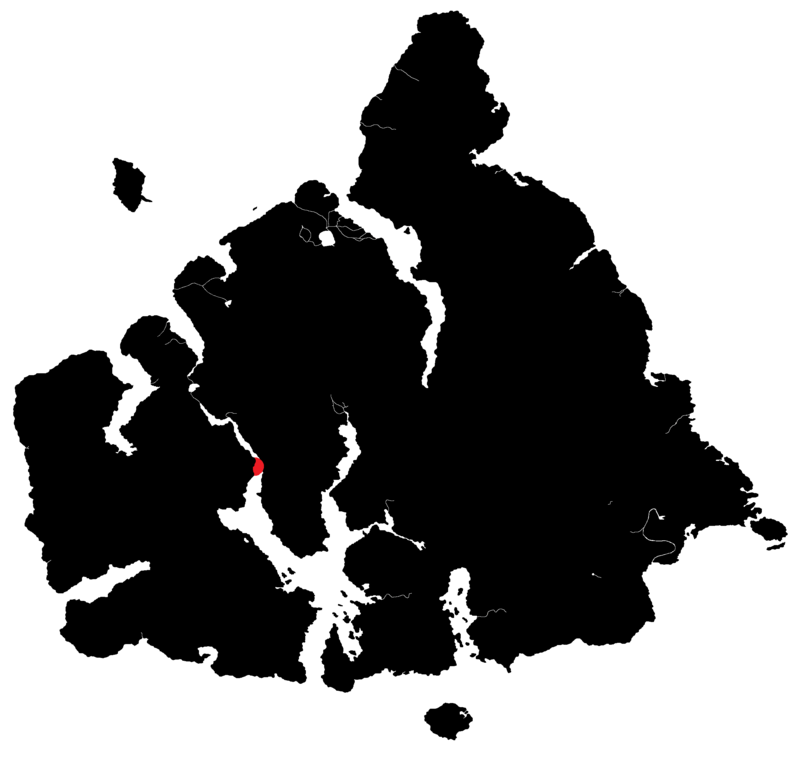 As of InGen’s last count in 1993, there were ten Pteranodons living on the island; how many were actually Geosternbergia is not known, or if any Geosternbergia actually remained by 1993. Including both P. l. longiceps and P. l. hippocratesi, there were precisely ten adult Pteranodons encountered between 1997 and 2001, though the P. l. hippocratesi are said to have been a covert project according to film director Joe Johnston and thus may not have factored into InGen’s overall headcount. By May 25, 1997, the pterosaurs with the exception of P. l. hippocratesi had broken free of whatever containment measures were in place on Isla Sorna. Six adult P. l. longiceps were sighted in the island’s northern grasslands on May 25; they are presumed to be males due to their crest morphology, but this is not confirmed for certain. Older concepts for The Lost World: Jurassic Park would have depicted either Pteranodon or Geosternbergia living off cliffs close to Velociraptor territory, presumably near the Workers’ Village. Several may have lived off of the island’s southwestern shore according to older Jurassic Park /// scripts, which indicate that these pterosaurs were responsible for the deaths of Enrique Cardoso and his associate. The junior novel Survivor depicts two Pteranodons, one living on the sandy western coast of Isla Sorna (which is killed by a Tyrannosaurus) and another circling close to the Embryonics, Administration, and Laboratories Compound. The first sighting was on May 23, while the second sighting would have been some days following this. The next junior novel in the series, Prey, depicts one adult Pteranodon roosting on Mount Hood on the night of December 30 and another flying near the Jurassic Park Ranger Station on the morning of December 31. Known (red) and hypothetical (purple) range of P. l. longiceps on Isla Sorna, between May 25, 1997 and December 31, 2001. Note that the range of Geosternbergia may overlap with the central waterway range of Pteranodon. The range of Pteranodon longiceps hippocratesi was much more restricted. Unlike the other pterosaurs, they failed to escape containment on their own. However, they did successfully breed, which implies that at least one male existed in the aviary at some fairly recent point. On July 18, 2001, there were four adult females and six flaplings in the aviary. 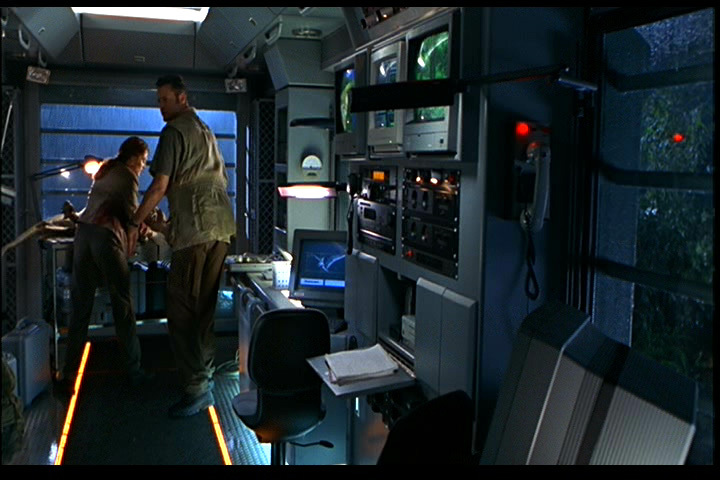 An incident occurring that day resulted in the death of one of the adults and possibly one of the flaplings; the surviving three adults were unintentionally released and left Isla Sorna. 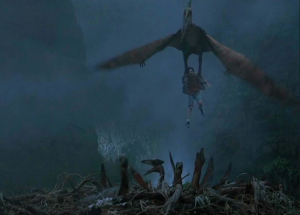 According to the junior novel Flyers, the third in the series, a family of escaped Pteranodons were eventually returned to the aviary on Isla Sorna in July of 2002. The novelization implies that they are the individuals released on July 18, but the descriptions do not match up with what can be observed and later material confirmed that those particular animals were neutralized in Victoria, British Columbia. Additionally, the novelization makes mention of several other adult males in the aviary which do not appear. It has been speculated since the release of Jurassic Park: The Game that these inconsistencies could be cleared up by explaining the pterosaurs from Flyers as the escapees from the Jurassic Park Aviary, but as Universal Studios has not confirmed either the Jurassic Park Adventures junior novels or the existence of the game’s Pteranodons as part of the official film canon, there is no evidence for the hypothesis. Nonetheless, The Evolution of Claire officially confirms that escaped Pteranodons were, in general, recaptured and held on Isla Sorna. Between late 2004 and May 2005, the remaining Pteranodons from Isla Sorna were rounded up and transported to Isla Nublar by Masrani Global Corporation, where they eventually died out while being replaced by Pteranodon longiceps masranii. Supposedly, none remain on Isla Sorna. The fate of the Geosternbergia is unknown; official sources have described them as “missing in action” when inquired about them, implying that InGen lost track of them at some point. Because of their strong flight capabilities, Pteranodons have left the islands in the Gulf of Fernandez where they were bred on numerous occasions. Three adult female P. l. hippocratesi which were released from the Site B Aviary on July 18, 2001 were eventually sighted over Victoria, British Columbia later that year. American security contractor Vic Hoskins apprehended and neutralized them. A different fate is given for the escapees in the junior novel series Jurassic Park Adventures; they are mentioned in Prey and physically appear in Flyers, by which point the flock consists of an old male, a mated pair including the elder’s daughter, and four sons belonging to the mated pair. The pterosaurs travel the subtropics around the world, with confirmed sightings and attacks in South America, Mexico, Texas, and the Florida Keys. Unconfirmed rumors had placed the pterosaurs in farther parts of the world, such as Britain and Japan. In July of 2002, the family had reached Florida and flocked to Universal Studios at Orlando due to the large artificial pool in the center. A tense day-long standoff between the pterosaurs and parkgoers ends with the animals being led to Isla Sorna and housed in the aviary. As discussed above, the idea that these are the Isla Sorna Pteranodons contradicts several aspects of the film canon, and it has been hypothesized that they could actually be the Isla Nublar Pteranodons from Jurassic Park: The Game, whose existence is also questionable. Jurassic World’s official website states that the natural range of their pterosaurs would cover over 120 miles, which would allow them to comfortably fly between Isla Nublar and western Costa Rica. Mercenaries led by Ken Wheatley retrieved three adult female Pteranodon longiceps masranii from Isla Nublar shortly before the eruption of Mount Sibo on June 23, 2018. They were removed from the island via the S.S. Arcadia and transported to the Lockwood Estate near Orick, California where they remained during the night of June 24. They were released from captivity by Maisie Lockwood to save them from hydrogen cyanide poisoning, upon which they fled into the surrounding pine forest. In the afternoon of or later than June 25, three adult female Pteranodons were seen flying north along the coastline; these were presumably the same three that were released previously. Sometime on or after June 25, three adult female P. l. masranii were sighted at the Eiffel Tower replica in Las Vegas, Nevada. This would place them roughly 150 miles from the Pacific Ocean, making this the farthest that Pteranodons have been confirmed to travel from the coast. Pteranodons are cathemeral, active at some times during the day but resting at other times. 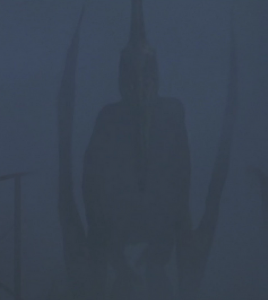 They appear to sleep at night, but are shown to become active at night if disturbed in the junior novel Prey as well as deleted concepts for The Lost World: Jurassic Park (which also considered featuring Geosternbergia, implying a similar behavior pattern). In both cases, the animals were portrayed becoming aggressive toward the people who had disturbed them. The junior novel Flyers, on the other hand, portrays a family of P. l. hippocratesi adopting a nocturnal lifestyle in order to avoid human activity, a behavior that has been observed in numerous mammals in real life. However, they still hunt during the day, though they prefer to actually feed on their captured prey in the evening or at night. In the mobile game Jurassic Park Builder, the Pteranodons (which resemble P. l. longiceps) are active for one-hour periods of time. In the sequel, Jurassic World: The Game, the Pteranodons (which in this case resemble P. l. masranii) are active for three-hour periods of time. 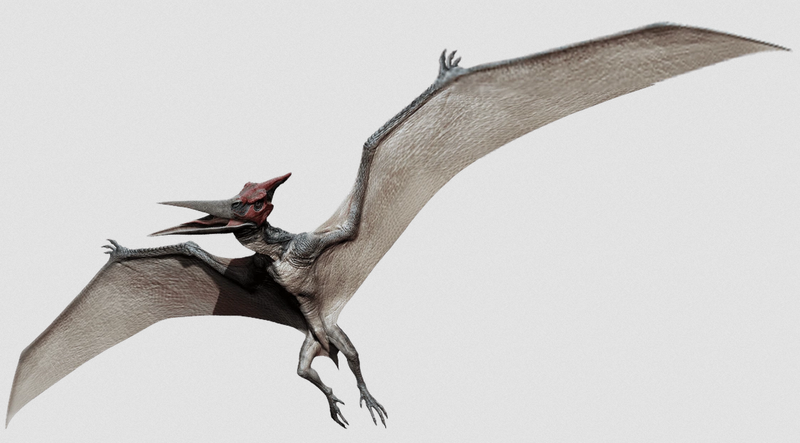 Pteranodon and Geosternbergia are considered to be piscivores, meaning that their diet consists largely of fish. While the feeding behaviors of Geosternbergia have never been witnessed and can only be inferred, these behaviors have been observed extensively in Pteranodon. Model of an adult female and flapling Pteranodon longiceps hippocratesi, demonstrating the aberrant teeth of their subspecies. The subspecific epithet hippocratesi refers to the existence of these teeth, despite the generic name Pteranodon explicitly meaning “wing without teeth.” Other subspecies of P. longiceps are toothless. Despite being considered a piscivore, this animal does actually feed on animals other than fish. It has been observed targeting humans and small dinosaurs for food, and likely preys on many types of small animal. When permitted to live in the wild, it will usually hunt fish in the ocean; however, it has done well in captivity on a diet of brackish-water or freshwater fish and other small animals. In the junior novel Survivor, a Pteranodon longiceps longiceps is observed flying low over the ocean’s surface and grabbing fish as they jump; the species of fish is unidentified. The same animal pursues a human across the beach shortly thereafter, but is unsuccessful. When hunting small prey, the sharp and pointed beak is used as the primary weapon, stabbing or scratching at the prey item. Biting at prey is most effective in Pteranodon longiceps hippocratesi due to its teeth, which are absent in all other forms of pteranodontid. Often, these pterosaurs will soar high above the ground riding warm updrafts while scanning the area below for food. Due to genetic modification, InGen’s Pteranodons (and presumably Geosternbergia) have grasping feet similar to those of birds of prey. While fossil specimens would only be able to use their feet to walk, InGen’s have adapted to their altered anatomy in several ways, most prominently by using their feet as hunting implements. A Pteranodon will grasp the upper body of a potential prey item and lift it into the air, dropping it into an ideal feeding location. However, this is not always a viable way to capture prey. An adult female Pteranodon longiceps hippocratesi struggles to hold an adult human aloft, though it can carry a child without much difficulty. On the other hand, an adult female Pteranodon longiceps masranii can easily lift an adult human into the air with no trouble at all; they have even been observed trying to pick up juvenile Triceratops, which can weigh around five hundred pounds, but can only hold them above the ground for a few seconds before dropping them. If a Pteranodon drops its prey from a great enough height, or onto dangerous terrain, it may easily injure its prey. Additionally, Pteranodons can take advantage of water to collect prey. In the junior novel Flyers, as well as during the 2018 Isla Nublar incident, Pteranodons were observed picking up humans and dropping them into large bodies of water where they would feed on them later. This was shown to be highly organized in Flyers, due to the dramatically increased intelligence of the P. l. hippocratesi and their strong familial relationships. Collected food would be eaten later, when the strongest male of the group permitted the family to feed. This cacheing method was less organized with the P. l. masranii on Isla Nublar, which only successfully captured one human this way, and continuously squabbled over their prey. However, unlike P. l. hippocratesi, which does not appear able to swim, P. l. masranii is an adept diver and can swim under the surface of the water. It may plunge into water from a great height by folding up its wings and essentially turning its body into a giant dart. Fossil evidence suggests that they could also float on water similarly to seabirds, plucking prey from beneath. A feeding behavior only observed in Pteranodon longiceps masranii involves a “feeding frenzy” method in which a large number of pterosaurs generates panic in their prey by swooping and vocalizing loudly. This initiates a fight-or-flight response in prey items, which may then act illogically while attempting to escape. While the prey items are panicked, the Pteranodons may easily pick off stragglers or injured animals. They have been observed cooperating with the smaller Dimorphodon in such feeding frenzies. Despite the apparent group effort of these hunts, there is no actual cooperation among the animals; they are known to fight over food and do not assist one another in any intentional way. Other methods of subduing prey used by Pteranodon include plowing into prey feet-first with wings outspread to knock over multiple victims, landing on top of a prey item and repeatedly bashing it into a hard surface, and making hit-and-run strikes with their talons while airborne. They may also scavenge carrion; a model produced for Jurassic Park /// portrays P. longiceps hippocratesi perching on a rocky structure with the carcass of a juvenile male Tyrannosaurus rex nearby. Pteranodon dung is distinctively birdlike, being whitish and caking onto surfaces. When dry, it crumbles easily. Its appearance and texture are similar to that of other piscivorous animals. Pteranodons are highly gregarious animals, nearly always seen among members of their own kind. It is possible that they may flock with Geosternbergia, which is presumed to be similarly social, but this is not known. 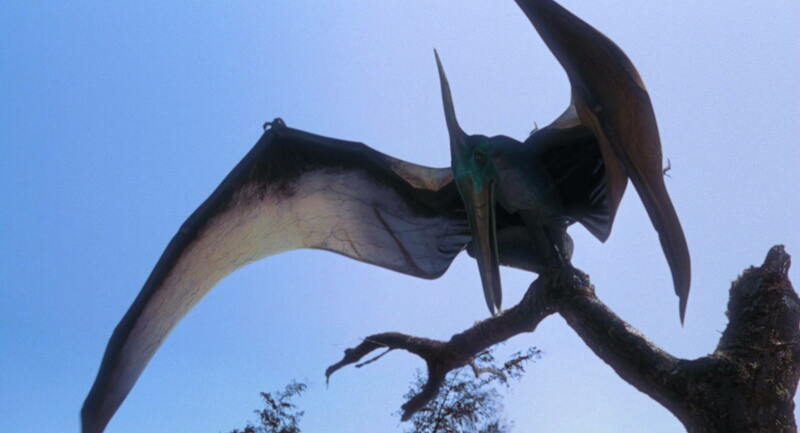 Pteranodons are frequently seen in groups of three; however, each of the three subspecies have been sighted solitarily on at least one occasion (though never in the films directly, rather in supplementary materials). Pteranodon rookery on Isla Nublar, 2017/2018. Image from the Dinosaur Protection Group. 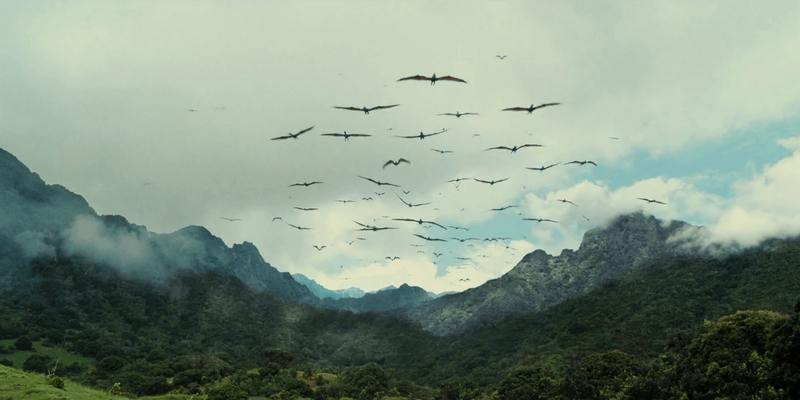 Due to its population size, the largest flocks of Pteranodon were those of the P. l. masranii on Isla Nublar. Flocks of these pterosaurs may contain over forty animals, though when confined to the Jurassic World Aviary this number was significantly higher. Since the eruption of Mount Sibo disturbed their nesting ground on the volcano’s slopes, it is not known if their flock sizes are still similarly large. When socializing with one another, Pteranodons tend to be quite loud. However, not all of their social displays involve vocalization. The head crests are presumed to be display structures, and the variability of facial and crest color in P. l. masranii in particular implies that they engage in visual displays. The bright red color of the black P. l. hippocratesi also suggests a display purpose, and if it is the male of the species, it is likely used for courtship or to intimidate rivals. Large flock of Pteranodons, accompanied by smaller Dimorphodons. Both of these pterosaurs are highly social, gregarious animals. According to the account in Flyers, familial bonds among Pteranodon longiceps hippocratesi can be extremely strong. In this account, a family group consisting of a senescent male, his daughter, her mate, and their four sons settled in Orlando, Florida after being attracted to a large artificial pool in the Universal Studios theme park during a drought. The eldest male, grandfather to the four young males, acted as a kind of mentor figure to the younger animals. In animals with strong family ties, the role of mentor is often taken up by animals that have passed reproductive age. The sexually-mature male was in charge of coordinating the hunting efforts and was high in the family’s pecking order; however, he would not start feeding until all his family was present and safe, indicating a level of empathy that likely resulted from the unusually increased intelligence of P. l. hippocratesi demonstrated throughout this account. The entire family group delayed their migration through the area due to their second-youngest flock member becoming injured; they refused to abandon one of their offspring even when there was no chance of his recovery without human intervention. A deleted concept for Jurassic World also demonstrates a similar empathic tendency in Pteranodon longiceps masranii, despite that subspecies’s lesser intelligence and tendency toward squabbling. 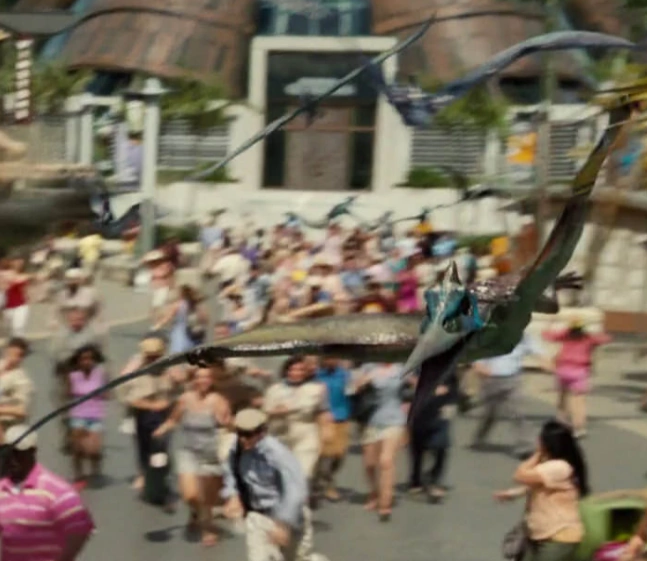 In this scene, one of the Pteranodons would have been seized by the Mosasaurus while attempting to extract a human from a damaged monorail over the Jurassic World Lagoon. Several other Pteranodons would have rushed to its aid, pecking at the mosasaur and risking their own safety in an attempt to rescue one of their flock. As with all pterosaurs, Pteranodon and Geosternbergia both lay eggs. Pteranodon in particular roosts in safe areas where predators cannot reach, such as cliffs, rocky pinnacles, and tall buildings; it nearly always nests near a source of food and water. According to Flyers, the males of at least Pteranodon longiceps hippocratesi will engage in physical combat in order to win the rights to mate; their efforts may be judged not only by the females, but by the females’ male relatives. In this subspecies, pair-bonds are very strong and may persist for years, if not a lifetime. The eggs are bright white, roughly three times the size of a chicken‘s egg; while the size of a typical clutch is not known, twelve eggs from surrogate parents were incubated simultaneously to hatch the first-ever Pteranodon longiceps masranii. Which subspecies was used to obtain the surrogate eggs is currently unknown. The Pteranodon longiceps hippocratesi living in the Site B Aviary as of the summer of 2001 were observed to have six living offspring, while the breeding pair of the family group from Flyers had four living male offspring as of July 2002; however, the original number of eggs laid in each case is not known. Nests consist of sticks, driftwood, foliage, and other debris that the parents collect from the environment. A mother Pteranodon provides live food to her flaplings. This allows them to practice killing their own prey without having to leave the shelter of their nesting area. After an incubation period of several months, the eggs will hatch; the young are sometimes called “flaplings” at this stage, because they are capable of limited flight fairly quickly. Young flaplings are already fairly tenacious predators, eagerly pursuing prey and taking it down using methods similar to the adults. In P. l. hippocratesi, adults may actively teach their young how to hunt, and a limited amount of parental care is confirmed. Adults will cooperatively protect their young in this subspecies, even if the young are not their own. One individual, presumed to be the mother, will often deliver live food to give the flaplings the opportunity to hunt and kill live prey, helping them develop essential survival skills for later in life. 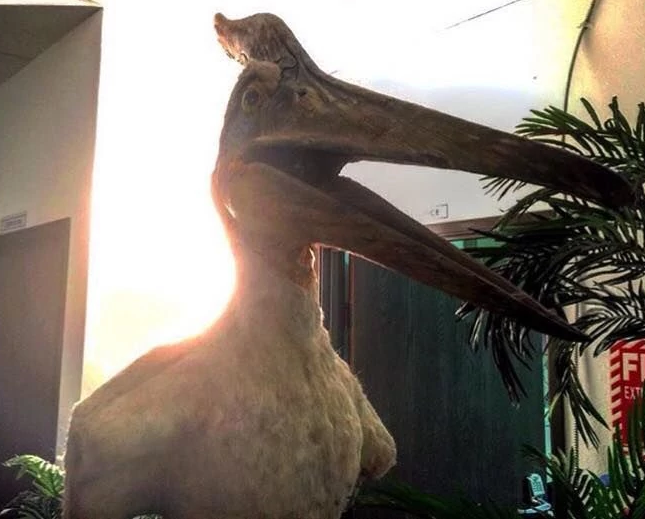 During the 2001 Isla Sorna incident, the pterosaur that was presumed to be the mother of six flaplings died due to the collapse of abandoned aviary infrastructure. Following her death, the other adults abandoned the offspring to fend for themselves, seeking out new nesting grounds on the North American mainland. This suggests that adults will leave a territory themselves rather than evict younger animals. However, the account in Flyers depicts family bonds persisting over a period of years, with animals from three successive generations living together and remaining protective of one another even as the youngest were capable of fending for themselves. Multigenerational family groups have not been observed in the other, less intelligent subspecies. The sounds produced by Pteranodon are highly varied. Screeching, squawking, and cawing noises are often used to communicate with one another while flying, with different calls used while traveling or hunting. These sounds are probably used to relay information throughout the flock, and to coordinate their movements as to avoid midair collisions. Even lone Pteranodons can be heard making such vocalizations, suggesting that they are an essential part of the animals’ psychological comfort. Cawing sounds are often used to signify aggression, and may be used during hunts to startle prey into moving. Growls and hisses are also used when confronting threats, in addition to loud shrieks which are used to startle enemies or alert other Pteranodons to danger. A primarily coastal-dwelling species, the Pteranodon feeds on fish that venture into shallow water; these may include bonitos. As they sometimes hunt on tidal rivers or bodies of freshwater, they could potentially come into conflict with spinosaurs; at least one has been witnessed competing for prey with a Velociraptor antirrhopus masranii. Prey other than fish are confirmed to include humans, which Pteranodons hunt with surprising frequency. They have been witnessed on two occasions attempting, though without success, to prey on juvenile Triceratops, and chasing after what appear to be laughing gulls (Leucophaeus atricilla). Because of their wide-ranging habitat, Pteranodons share territory with numerous other animals. As they are rather aggressive toward other species and highly territorial, they likely come into conflict with rival species fairly often. On Isla Nublar, they have been sighted in areas that were home to carnivorous dinosaurs such as Carnotaurus, Allosaurus, and the fish-eating Baryonyx and Suchomimus, with which they likely competed for prey. Many species of herbivorous dinosaurs also live in their territory, as do the omnivorous Gallimimus and diminutive Compsognathus, which have unknown relationships to Pteranodon; it may have preyed on the smaller dinosaurs in its environment. On Isla Sorna, it is known to live close to animals such as Stegosaurus and Tyrannosaurus, which it does not appear to fear. This is despite two known attempts by Tyrannosaurus throughout the Jurassic Park Adventures junior novels to prey on Pteranodon; in one case, the Pteranodon had been intentionally harassing a tyrannosaur on a beach by diving low over its head. The tyrannosaur retaliated by snatching the pterosaur and thrashing it to death. The second known interaction between the two species was a simple attempt at predation. Pteranodons on Isla Sorna also lived within the ranges of Brachiosaurus and, while confined to the aviary, Spinosaurus. When walking, Pteranodon is a quadruped. A supposed deleted scene from Jurassic Park /// would have had a violent conflict between Velociraptors and Pteranodons, but the nature of the scene is not known. 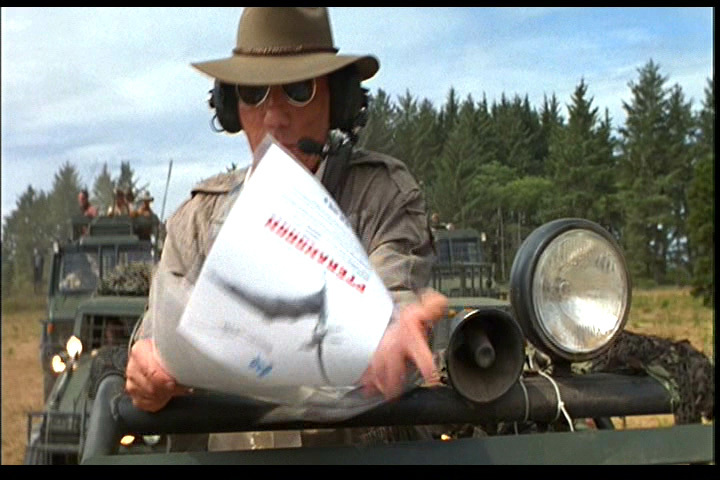 However, a confirmed deleted scene from The Lost World: Jurassic Park would have featured Pteranodons and/or Geosternbergia living comfortably in or near a Velociraptor territory. Mosasaurus maximus is known to prey on Pteranodon; the artificial genus of theropod Indominus rex has been observed attempting to attack Pteranodon without success. Not all of this pterosaur’s relationships with other animals are confrontational, however. 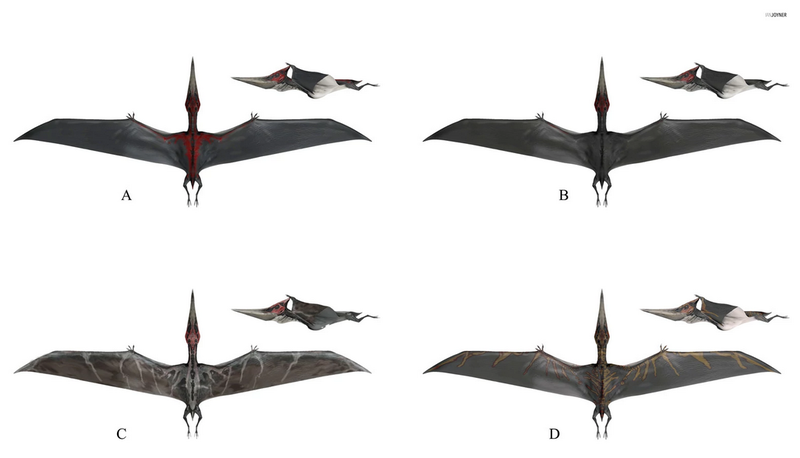 Concept art implies that both Pteranodon and Geosternbergia can cohabit the same area, and Pteranodon longiceps masranii will tolerate the presence of Dimorphodon willingly. The exact nature of the relationship between Pteranodon and Dimorphodon is not fully understood, but it appears to be at least a commensal relationship, as the smaller pterosaurs benefit from the protection of the larger ones. The first Pteranodon or Geosternbergia to be brought back from extinction hatched sometime between 1986 and 1993, presumably at least a few years before 1993. There are two schools of thought on which Pteranodon subspecies was created first. One holds that P. l. hippocratesi was a kind of failed first attempt, citing its aberrant teeth as evidence for it being unfit for Park exhibition. The other, which is presented in the junior novel Flyers, suggests that P. l. hippocratesi was modified intentionally to be smarter, stronger, and larger than a normal Pteranodon so that it could perform in shows for entertainment purposes. Whichever the reason, P. l. hippocratesi was clearly held under much more secure conditions than P. l. longiceps. Due to its aggressive and territorial behavior, Pteranodon is likely to feel threatened by aircraft such as helicopters and may attack in defense of its territory or its flock. It was intended to be displayed in Jurassic Park, where it would be visible from the main tour, the Jungle River Cruise, and the lodge within the aviary on Isla Nublar. However, this subspecies is known to be aggressive, and has caused at least one confirmed death as well as numerous injuries. It may also be a hazard to air traffic, as its territorial behavior and increased strength often drive it to view helicopters and other airborne objects as enemies. Between the concrete film canon and supplementary stories, three helicopter crashes can be attributed to Pteranodons, two of which involved P. l. hippocratesi. However, they will sometimes ignore helicopters if they are outnumbered, or outside of their recognized territory. One boat crash has been attributed to P. l. longiceps, but the true cause of the crash is unconfirmed. 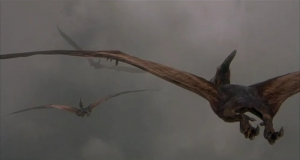 Both P. l. longiceps and Geosternbergia are hypothesized to be aggressive toward other airborne objects, mechanical or otherwise; the original script for The Lost World: Jurassic Park would have seen them attack both helicopters and paragliders. Aggression toward paragliders has been directly observed in P. l. hippocratesi. The incident in Victoria, British Columbia involving three P. l. hippocratesi garnered much negative press against Pteranodon, as well as de-extinction at large. 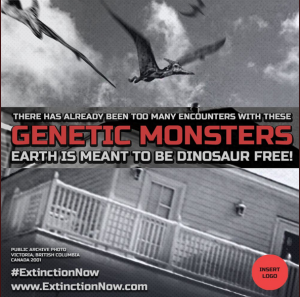 The anti-dinosaur political activist group Extinction Now! cited that incident when advocating for re-extinction. However, this did not stop Simon Masrani and Masrani Global Corporation from attempting to recapture Pteranodons to exhibit in Jurassic World; as of 2004, the corporation was developing a new synthetic polymer to construct a more secure aviary on Isla Nublar. This followed several successful escape attempts. In late 2004, Dr. Henry Wu succeeded in producing Pteranodon longiceps masranii, which is believed to have fewer genetic anomalies than the preceeding subspecies. It was the first new breed of animal created for Jurassic World; twelve individuals were hatched. Eventually, this subspecies completely replaced those that had existed before it. For the full ten years of Jurassic World’s operation, these pterosaurs existed in the Jurassic World Aviary, where visitors could observe them from the secure walkways below as they soared about and fed on fish from the rivers. The Aviary remained a popular attraction throughout Jurassic World’s history and was frequently advertised, with the Pteranodons being prominently featured in marketing. Footage of Pteranodons attacking tourists during the 2015 Isla Nublar incident, such as this surveillance footage shared by the BBC during a June 22, 2018 news report, has circulated for years and become emblematic of the supposed threat de-extinction poses to human life. During the park’s operation, a minor incident occurred in which a Pteranodon stole a tourist’s hat. 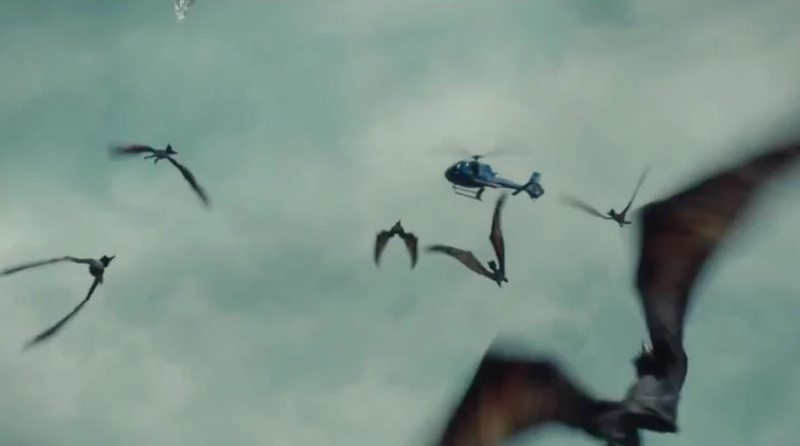 The Pteranodons, along with the Dimorphodons with which they cohabited, were released from the Aviary on December 18, 2015 due to a chain of administrative mistakes culminating in the helicopter JW001 plummeting through the Aviary’s dome. Prior to this, the escaped Indominus rex had broken a hole through the ground-level wall. The crash of JW001 was due to damage sustained when several Pteranodons responded to its presence as a threat to their territory, which caused several to die in the attack. The escape resulted in Simon Masrani’s death as well as two ACU personnel, and as the animals migrated to the Jurassic World Lagoon, they also caused scores of injuries in the single largest public scandal in the park’s history. This, more than any event involving the Indominus directly, resulted in the closure of Jurassic World and financially devastated Masrani Global Corporation. 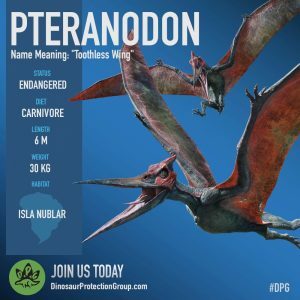 The Dinosaur Protection Group, operating mainly in 2018, attempted to counteract the negative press surrounding Pteranodon and other dinosaurs by explaining their behavior. According to the DPG’s sources, the Jurassic World Aviary was actually not a suitable environment for its inhabitants, leaving them stressed, cramped, and understimulated. Upon their release, they flocked to a more comfortable environment: a source of salt water where food was available and ample nesting space existed. This put them in direct conflict with the tourists in the park. The DPG blamed the ensuing carnage entirely on the exploitative conditions under which the pterosaurs were kept, claiming that it was the inadequate care provided by InGen that resulted in their aggressive attack. However, the negative press brought on by the attack still lingered. 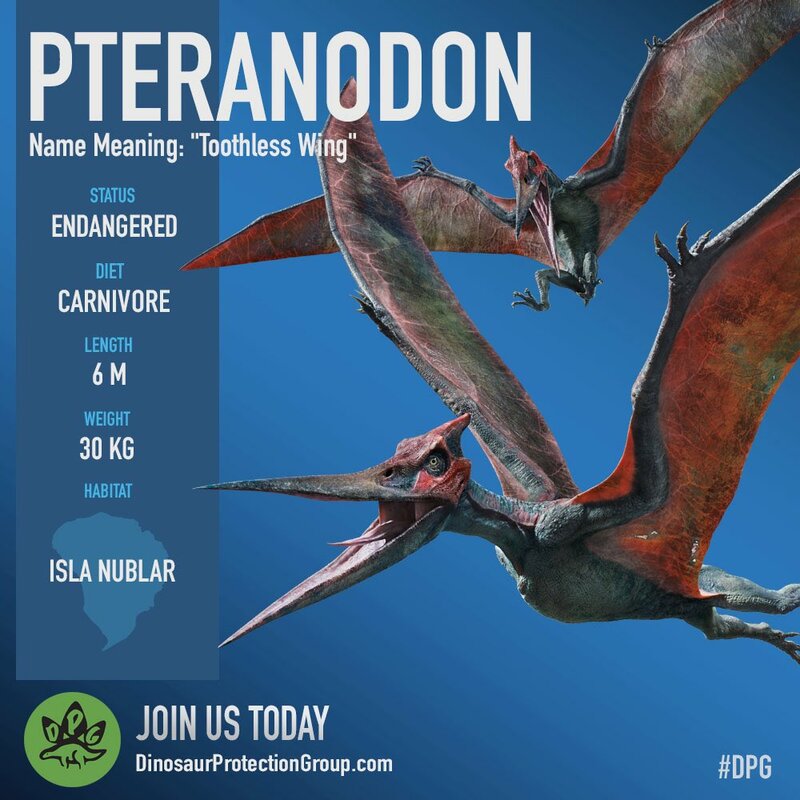 Pteranodon was one of the species targeted by Ken Wheatley during the illegal 2018 dinosaur extraction campaign. Three adults were captured and transported to the Lockwood Estate, where they were held in the basement laboratory to be auctioned off. However, as the auction was interrupted, these animals were not sold, and instead were released by Maisie Lockwood in order to save them from hydrogen cyanide poisoning. One of the Pteranodons killed a mercenary hired by Eli Mills by picking the man up and dropping him into a car windshield; as it did not attempt to eat its kill, this appears to be the first known instance of a Pteranodon killing purely out of retaliation for being mistreated rather than out of hunger or in defense of its territory. 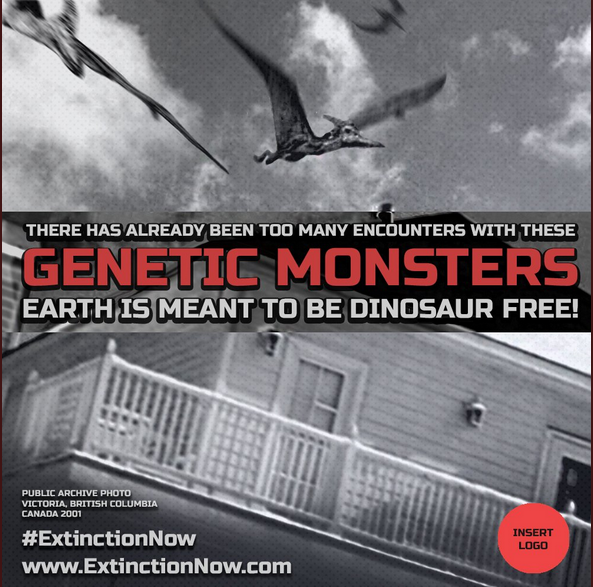 This unused Extinction Now! poster would have used imagery of the Victoria incident to sway public opinion in favor of re-extinction. Their ability to fly long distances with relative ease, along with their territorial nature and tendency to view humans as potential prey, makes Pteranodon one of the more dangerous de-extinct animals alive today. They typically remain near the coast and so their movements can be predicted to some degree, but at least three individuals have been sighted as far inland as Las Vegas, Nevada. For the time being, no males are known, so breeding is thought to be unlikely; however, the global population size is greater than that of any other de-extinct animal as of 2019. Geosternbergia is known to have been cloned in the film universe due to physically appearing in an official InGen species guide, the mobile laboratory’s screensaver, and in concept art and models made for the film. It has been suggested that the intended use was for this species to be the male of P. longiceps, though this has never been confirmed and would be a gross scientific inaccuracy if true. Those in favor of considering these two genera as sexually dimorphic forms of the same species have cited these quotes in The Making of The Lost World: Jurassic Park, page 25. Despite Geosternbergia not featuring in any films, it does appear in the arcade game and PS1 video game based on The Lost World: Jurassic Park. In the former, it attacks the player near a laboratory facility, while in the latter it appears as a non-threatening background character.